Departure dates from Quito in 2017: Thursdays May 25, July 13, August 3 or September 14. Day 1: Arrival at Quito airport, transfer to hotel, welcome dinner. Day 2: City tour (local market, fruit tastings, cooking class (lunch included)). Day 3: Departure to San Clemente (3hours from Quito). Along the way, taste chirimoyas, a local heart-shaped fruit, visit a local bizcocho factory to taste these local cookies, stop at the artisanal indigenous market. Unique experience to stay with one of the community families - learn more about the family traditions, local agriculture, natural plants and cooking. Lunch will be served on arrival and you will prepare dinner together with one of the local families in the afternoon. Day 4: Preparation of pambamesa (ritual in which different families prepare food for a community meal, served outside close to the soil). You get to cook with them. Visit the Papallacta hot springs (approx. 3,5 hours) in the afternoon. Day 5: Bathe in the thermal waters or hike a trail along the Rio Papallacta (1 hour). In the afternoon, drive to Isinlivi (approx. 4 hours) to visit a cheese factory and learn how to prepare a traditional dish of cuy (guinea pig) for dinner. Day 6: Visit breathtaking Quilotoa crater lake. Optional walk all the way down to the lake and up again (or mules to rent). Final stop at Banos, located in a valley surrounded by rivers and beautiful waterfalls. This small town in the Andes is a great destination for adventure travelers but also wellness seekers. Day 7: Visit artisan workers making varieties of candy (melcochas) from sugarcane and aguardiente, a strong alcoholic beverage. Take ther est of the day to relax or participate in one of many activities that Banos has to offer: mountain biking to waterfalls, rafting, canyoning, etc. Day 8: Drive to Guamote for a great view on the Chimborazo volcano (6310 meters). Stop in the Palacio Real community for lunch to try a dish made with lama meat and participate in a culinary workshop to learn how to make empanadas. Day 9: Hike adventurous trails with a local guide, crossing fresh water rivers and passing huge rock formations near lake Ozegoche to learn about local traditions, legends and mysteries surrounding the lake. Prepare a trout lunch together with an indigenous family following the hike. Day 10: Drive to Cuenca with a stop in Alausi, to take the spectacular train to ride 'Nariz delrnDiablo.' Make a stop in the village of Sibambe to observe a traditional dance performance and visit a small interpretation center. Head back to Cuenca for a group dinner in one of the best restaurants in Ecuador. 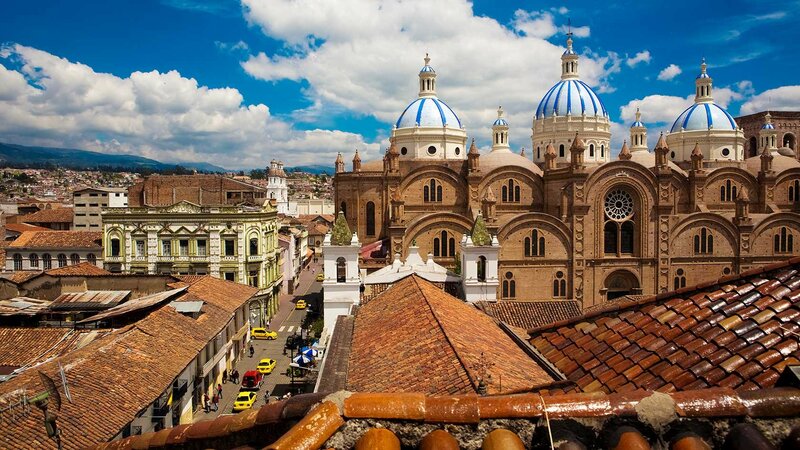 Day 11: Explore the colonial center of Cuenca on your own time (stunning churches, narrow streets and beautiful plazas). Attend a chocolate workshop in the afternoon. Cuenca offers some of the world's most delicious chocolate. Day 12: Travel to Guayaquil, with an interesting stop at a cacao plantation. Learn about the cacao tree, its fruit, and the basic process of making cacao and 100% organic chocolate. A typical coastal region lunch will be served in the afternoon. Goodbye dinner with the group in the evening. Day 13: Departure day. You will be transported to the airport in Guayaquil for your flight home. Optionally choose to start a Galapagos program extension. Must be 18+ years old and interested in food and discovering a new culture! Good general health required. Registration fee when booking : $250 (refundable if tour is cancelled by CICD for lack of participants).